It’s not often that someone takes on such lofty challenges as summiting the tallest freestanding mountain on earth and crossing the finish line of the toughest race on the planet; but it’s even rarer when that person has been diagnosed with cerebral palsy. Years later, Paddock has those two incredible accomplishments under his belt, along with a few others. He has created a foundation and has raised more than a million dollars for kids with disabilities. Paddock is also a public speaker and an author; his new book One More Step: My Story of Living with Cerebral Palsy, Climbing Kilimanjaro, and Surviving the Hardest Race on Earth is on sale now. He took some time to answer a few of our questions on eliminating limitations, overcoming fear and how it feels to do something so many thought was impossible. The Active Times: When you were diagnosed, do you remember what was it was that made you think “I won’t let this limit me”? Bonner Paddock: Well, as I write about in the book, my diagnosis was a bit unconventional for several reasons. After I was diagnosed, it wasn’t something that my family talked about. When it came to my own thoughts about it, I didn’t really know how to feel, so I just pushed it away. I went on living my life, pretended it wasn’t there. I did that until I was 29. Until that point, I’d been leading a “normal” life, walking with a limp that I was often able to pass off as an old sports injury. Even those closest to me had no idea I had cerebral palsy. So from the start I didn’t let it limit me, but I also wasn’t acknowledging the truth of my situation, which was a big part of what climbing Kilimanjaro and competing in Kona were about. Personally, how do you define “living life to the fullest,” and how have all of the incredible feats you’ve accomplished fit into that definition? For me, I think it means accepting each day for what it is, not what I wish it would be. The challenges that life puts in front of us are often what makes life worth living. For a long time, I was in denial about what my challenges were and what I needed to do to embrace them. With Kilimanjaro, but especially with Kona, I think I accepted challenges that broaden my own sense of what I was capable of. Having survived those challenges has allowed me to fully acknowledge the everyday challenges that CP presents me with and embrace them, rather than running away. How do you overcome the mental fear of a physical challenge? What have you learned about this from what you’ve accomplished? I can’t sit here and tell you that you need to just ignore your fear of physical challenges or pretend that fear isn’t there. I talked about this in the book, but before I climbed Kilimanjaro, I don’t think I was honest with myself about what the risks were and what role fear had to play. As a result, I think the actual climb was harder because I had to face those fears for the first time while I was on the mountain and I wasn’t at all prepared for them. Now I’m not saying that when you tackle an endurance event, you need to dwell in your fears beforehand or let them control you; all I’m saying is that ignoring them entirely will catch up with you. I’ve found the best way to deal with your fears is to acknowledge them but don’t allow them to impede your journey. What were you thinking at the moment that you summited Kilimanjaro? At that altitude with that level of exhaustion, my brain wasn’t thinking in straight sentences let alone well-articulated thoughts. More than anything, I was relieved. Relieved that I’d done it, relieved that I didn’t have to go up any more, relieved that I hadn’t seriously injured myself. Then I realized I still had to get down. 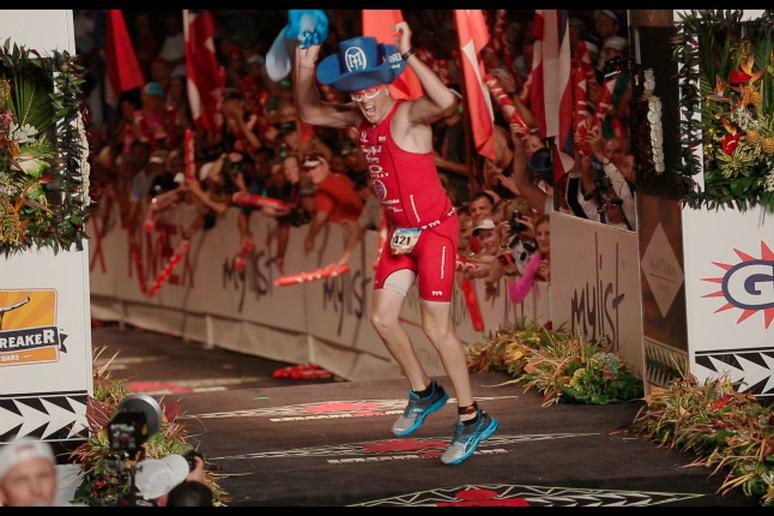 Can you describe the feeling of finishing the Ironman? The only word to describe the emotion I felt is euphoria, followed quickly by complete and utter exhaustion. This was a goal I’d spent two years working toward and finishing it produced a sense of accomplishment that was unlike anything I’ve felt before. But I’d known the whole time that in the process of becoming an Ironman would take a toll on my body that was unlike anything I’d done before. The day before the race, the head of Ironman medical team told me that he’d see me at the finish; mere minutes after I crossed the finish line, that proved true. Who is the most inspiring or fascinating person that you’ve met on your journey and why? Honestly for me, when it comes to inspiration, it all begins, and ends with Jake, the boy with CP who passed away shortly after I met him. Jake inspired this whole journey. I didn’t know him for long but his spirit and the gift that it gave the people around him has been the driving force for all this. I’ve spent the years since his death, getting to know his family and understanding the profound impact that he had on all of them. Even now, years later, I still find myself awed by how Jake’s short life has had such a lasting influence. Can you talk a little bit about the title of your book and how pushing yourself to take just “one more step” can be an effective motivational strategy in challenging times. As I write about in the book, “one more step” was a phrase that I used to push myself through these challenges I faced. But in truth, it’s not just limited to mountain climbing or races. CP, of course, is a condition in which muscles, the very building blocks of movement, aren’t communicating with the brain as they should be. As a result, every step that I take each day requires far more energy, focus, and control, than most people ever have to experience. Sure, I can think of the phrase “one more step” when I’m climbing a mountain or running a marathon, but on a daily basis, it’s something that I have to think of when I wake up in the morning and first get out of bed. To me, that’s what the words “one more step” are really about. They’re words that push me through the biggest of obstacles, along with the smallest. What advice would you give to someone who's been diagnosed with a serious health issue and is really struggling with it mentally? I think first and foremost I’d say, don’t hide from it. On a personal level, I spent a long time ignoring my CP because the specifics of my condition allowed me to do that. The problem with that strategy is that by not dealing with the issue, you’re just allowing it to get worse. As much as this book is about these feats of endurance, at its heart it’s the story of my journey to acceptance of CP. As hard as it is, you have to confront that diagnosis as what it is: a challenge that needs to be overcome. Maybe it’s a challenge that will be with you your whole life, or maybe it’s a challenge that’s just with you for the short term—whatever the case you have to accept the role that this health issue is going to play in your life. Because healing process can’t start until the acceptance has begun. What made you choose to conquer Kilimanjaro and then race Kona, as opposed to other incredible feats? With Kilimanjaro, it was a bit of a gamble. I was trying to find something that would make a statement that anything was possible, and while climbing a mountain was a fitting metaphor, it didn’t take long for that to literally become the idea. The idea behind Kona wasn’t quite as haphazard. Following Kilimanjaro, I knew I still had more that I wanted to prove to myself about what I could endure, but climbing another mountain didn’t seem like the best idea. I thought about a few possibilities, but in the end the thought of doing Kona was just too irresistible. After all, it’s the most badass race out there! But more than that, it was something I’d grown up watching—I’d seen how brutal it could be on the competitors and I knew that it would show, more clearly than anything else, that limits only exist in our minds. Can you tell us about working with the OM Foundation? Right now we’re working toward taking our message of living life to the fullest and encouraging others to test their own sense of what’s possible. Through Team Jake, we started a program called the Team Jake Global Challenge which is a two year program based around the OC Marathon and many other races around the world. Our goal is to have participants train and complete a half marathon in 2015 and go on to finish a full marathon in 2016. We are expecting over 1,000 team members to take part globally and help raise money for children with special needs. Most immediately, I’m still focused on being medically cleared to do athletic activities. Competing in Kona took such a toll on me that my body is still recovering, and only recently have I been able to get back to physical activity. My hope is that I’ll be able to run the OC half marathon and do my part for the Team Jake Global Challenge, but even if I can’t run it, I’ll walk it. After Kilimanjaro and Kona, I don’t need any more big adventures—sometimes just walking down the street is enough. Bonner Paddock is the author of One More Step: My Story of Living with Cerebral Palsy, Climbing Kilimanjaro, and Surviving the Hardest Race on Earth, co-authored with Neal Bascomb and published March 2015 by HarperOne, an imprint of HarperCollins Book Publishers, hardcover, RRP $27.99.